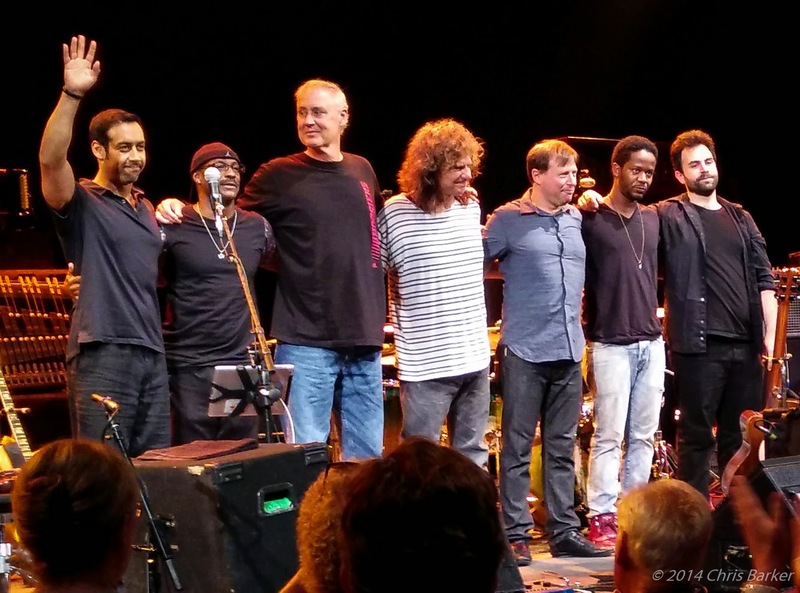 The Pat Metheny Unity Group made a spectacular appearance at Wolf Trap on a steamy summer Wednesday night. Along for the ride was the always effervescent Bruce Hornsby accompanied by Sonny Emory on percusssion (including vest frottoir) and drums. Bruce opened the nearly three hour non-stop concert with some "campfire" songs featuring dulcimer with Pat Metheny sitting in on a couple of tunes. Bruce moved to the piano for more music that included nods to 20th century composers such as Anton Webern (Hornsby pointededly pointillistic) and Elliot Carter. Bruce seemed in good cheer and frequently interacted with listeners in the front rows. Bruce also mentioned he has a new album out now called Solo Concerts. Pat's Unity Group is a very fine tuned engine that has only improved over time - this concert being "gig 118" according to Pat. Chris Potter on sax and flute continues to be a strong foil to Pat's all encompassing guitar orchestra. Ben Williams has massively matured since I first saw him with the Unity Band several years ago. The concert finale was a rousing full Pat Metheny group featuring Bruce Hornsby playing his signature song The Way It Is.